Now here's a picture with a long history of very gradual development. 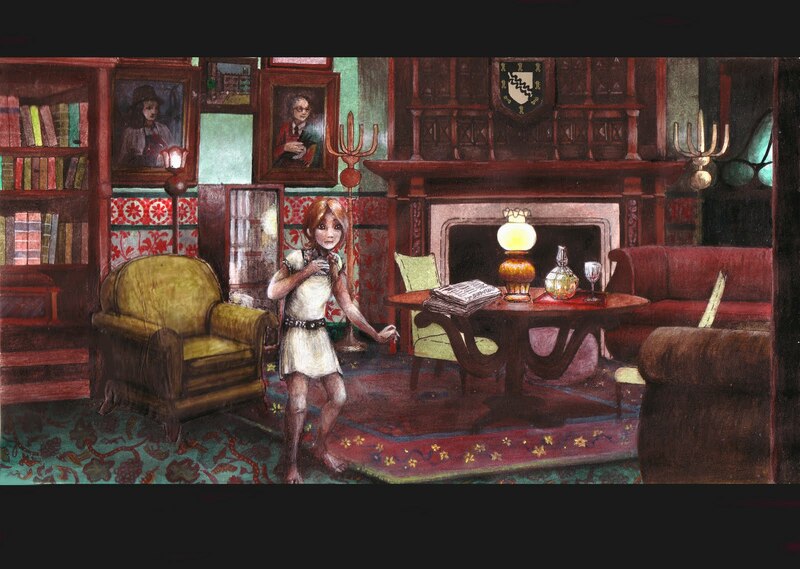 It's a His Dark Materials illustration; Lyra Belacqua in the Retiring Room of Jordan college at the beginning of Northern Lights. She's just heard someone approaching and is about to leap behind the armchair to hide. It's been about three? four? years since I started this. In fact! I've got a picture of it at an earlier stage here. And I wouldn't exactly say it's finished, because where's Pantalaimon? But the elements that are there, are... finished, I guess. The latest burst of activity is the third or fourth such since the thing was begun, each representing several weeks of attention to the thing. As for Pantalaimon I'm stumped on what form he should be in and where he should be placed. In the book he's a moth throughout this scene, but when I was in the earlier stages of painting this I imagined maybe I'd make him a bird of paradise for a couple of reasons: a bird starting into surprised flight would bring a lot of movement to the picture; the colours would pick up on their more sombre versions of the room; a bird of paradise would be quite incongruous with the staid, English surroundings, implying the uncanny, magical nature of daemons. But I've become uncertain. I feel like he should maybe tie in with Lyra's grey-scale colour scheme rather than the room's colour scheme. Hello! I've finally found my way to your blog (it's Lucy, new flexible/casual at the NPG) and am in awe! Firstly, I LOVE His Dark Materials (book-format) so the subject alone scores points with me. Your portrayal is much closer to how I imagined it than the steampunk-art-nouveau the film used.. I have absolutely no ability to draw backgrounds, my blog is full of blissfully floating figures & faces, so I have huge respect (and envy) for how you've managed to create a whole atmospheric scene. I can only imagine how long all the brocade patterns must have taken! OK I've rambled a lot. One last thing: I think Pan as a bird of paradise is a brilliant idea!! You could make him white to tie in with Lyra-colours? Like a dove, but better. Um... Harry Potter fanart. Apparently.